An exhaustive report on Portland Harbor contamination -- written by industries and local government agencies that will likely have to pay for much of the cleanup -- tends to "minimize the risks to human health and the environment" from harbor pollution, federal regulators say. The 13-page critique is a strong signal from the U.S. Environmental Protection Agency, which oversees Oregon's largest Superfund site, that it plans to hold polluters and land owners' feet to the fire on harbor cleanup. The work is expected to cost up to $1 billion, paid for industry, landowners and Portland's sewer and utility ratepayers. EPA officials say the October report from the Lower Willamette Group prematurely rules out some harbor contaminants as threats to wildlife and overstates uncertainties about the pollution's risk to human health. "They tried to make some inappropriate claims about what's risky and what's not," said Eric Blischke, an EPA project manager. "They just really kind of beat that to a pulp to some degree." 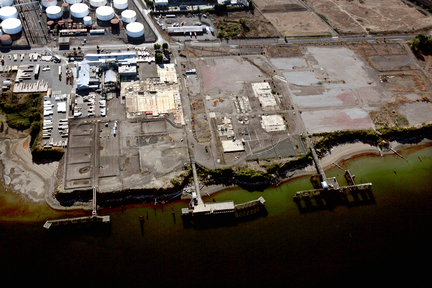 The Lower Willamette Group paid $74 million for the harbor investigation with input from the EPA. The group's 14 members include the city, the Port of Portland, Northwest Natural Gas and big Oregon industries such as Gunderson, Siltronic and Evraz Oregon Steel. The dispute is important: The lower the risks of harbor pollution in Willamette River sediment, the less cleanup work the group's members and other harbor landowners will have to do. Barbara Smith, the group's spokeswoman, said the draft report does not lowball risks. "Everybody believes the process and the data and the data collection are all really good. We're glad this project is moving forward," she said. The report includes results from more than 6,000 sediment and water samples and tests of fish and shellfish tissue conducted over eight years and along 10 miles of river, pinpointing where contaminants are highest. Finishing a draft was perhaps the most significant milestone since the EPA declared the harbor a Superfund site 10 years ago. So far, the basic contaminant data in the hundreds of pages of reports looks good, EPA officials said. They don't expect the dispute to delay progress on cleanup. Regulators hope to have a cleanup plan in place by the end of 2012. But when it comes to deciding how much contaminated sediment to clean up, much will ride on the interpretation of risk to humans and to critters. That will help determine whether contaminated sediment is capped or -- at much higher cost -- dredged. It'll also help determine how much dredging or capping gets done. Much of the risk is tied to estimated consumption of fish full of harbor pollutants, particularly PCBs, once common as insulators and in other industrial applications. PCB concentrations in fish on both the Willamette and the Columbia range from 20 to 100 times higher than EPA targets, the report found. That's why hackles rose at EPA's Portland office when the Lower Willamette Group's human health narrative emphasized that the risk assumptions about how much fish people eat are "potentially significantly higher than actual risks." The highest ingestion rates used were about 19 to 23 fish meals a month, all from the 10-mile study area. EPA says that's a reasonable estimate based on studies of tribal families and subsistence fishermen with heavy fish diets. The EPA's letter said the report too quickly ruled out other contaminants harmful to wildlife, such as pesticides and tributyl tin. The report's conclusion that the majority of contaminants identified in the draft report posed no unacceptable environmental risks, EPA said, is "incorrect."